On Friday, 22 March 2019, In excessive use of forces against the peaceful protesters on the 51st Friday of the Great March of Return and Breaking Siege in the eastern Gaza Strip, Israeli forces killed 2 Palestinian civilians and wounded 181 others, including 53 Children, 5 Women, 1 Paramedic, and 3 Journalists. Three Injuries of those wounded were reported serious. According to observations by PCHR’s fieldworkers, the Israeli forces who stationed in prone positions and in military jeeps along the fence with Israel continued to use excessive force against the protestors by opening fire and firing tear gas canisters at them. As a result, dozens of protesters were hit with bullets and teargas canisters without posing any imminent threat or danger to the life of soldiers. Moreover, PCHR’s fieldworkers said that the Israeli forces raised the sand berms on which the snipers station, particularly in eastern Khan Younis, enabling them to see clearly and completely the area where the protestors are spread and deep into the Return encampment. These new violations come only hours after the UN Human Rights Council adopted a resolution on accountability brought by Pakistan on behalf of the Organization of the Islamic Conference (OIC). The vote had 23 states voting in favor, 8 against and with 15 abstentions, condemning Israel’s “apparent intentional use of unlawful lethal and other excessive force” against civilian protesters in Gaza. Thus, these incidents emphasize that the Israeli forces persist in its violation of the international humanitarian law and international human rights law. Nedal ‘Abdel Karim Ahmed Shatat (29), from al-Mughraqa in the central Gaza Strip, was wounded at approximately 17:20 with a bullet that entered the left side of his chest and exited the right side when he was among the protesters around 50 meters away from the border fence, east of al-Bureij refugee camp. At approximately 17:40, he arrived a dead body at Shuhaa’ al-Aqsa Hospital. Jihad Munir Khaled Hararah (24), from al-Shija’iyah neighborhood in Gaza City, was wounded in eastern Shija’iyah and arrived at 16:50 at al-Shifaa’ Hospital, where his death was declared at 17:30. The Israeli bullets and tear gas canisters wounded 181 Palestinian civilians, including 53 Children, 5 Women, 1 Paramedic, and 3 Journalists. 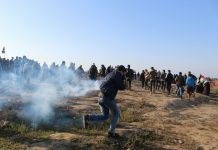 In addition, dozens of protesters, paramedics and journalists suffered tear gas inhalation and seizures due to tear gas canisters that were fired by the Israeli forces from the military jeeps and riffles in the eastern Gaza Strip. The Israeli forces targeted the medical field point in eastern Bureij Refugee Camp; as a result, one of the paramedics suffered tear gas inhalation. A PRCS volunteer paramedic was also hit with a tear gas canister to his hand in eastern Jabalia. This indicates the Israeli systematic policy to target the medical personnel and obstruct their humanitarian work guaranteed with protection according to international humanitarian law. Among those wounded, 537 are in serious condition and 114 had their lower or upper limbs amputated; 100 lower-limb amputations, 2 upper-limb amputations, 12 finger amputations and 25 children had their limbs amputated according to the Ministry of Health. The number of those wounded only include those wounded with live bullets and directly hit with tear gas canisters, as there have been thousand others who suffered tear gas inhalation and sustained bruises. PCHR emphasizes that continuously targeting civilians, who exercise their right to peaceful assembly or while carrying out their humanitarian duty, is a serious violation of the rules of international law, international humanitarian law, the ICC Rome Statute and Fourth Geneva Convention. Thus, PCHR reiterates its call upon the ICC Prosecutor to open an official investigation in these crimes and to prosecute and hold accountable all those applying or involved in issuing orders within the Israeli Forces at the security and political echelons.